When it comes to shorts we have many different styles. 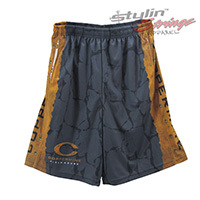 We have lacrosse cuts that can come with or without side pockets. Sew in side panels that are nice for putting team names & logos in that are lined with piping. Basketball shorts are a little longer than lacrosse shorts. We also carry compression shorts for track and field. We can make the women’s cut longer for men. We also have women’s cuts for lax & hoops. Skort’s are also thrown into the shorts category since they have the option of a sewn in compression short. 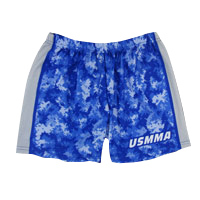 The unique styles and custom designs will turn your opponents heads. This is a multi-sport cut for shorts. Add a team name, pattern, accent color or whatever you want in the side panel sandwiched by piping that can also be a different color. The pockets, if you want them, sit on the front piping line. You can go with a traditional mock mesh or a more sheen with a four way stretch fabric. The same thickness of fabric feels thinner with four way stretch. This short cut is a full wrap around panel. If you want pockets they sit right in the side of the short with a seamless flap allowing the art to be unaffected. 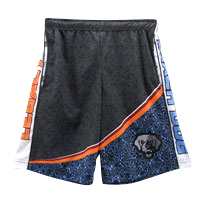 This style of short allows for full print designs. We let the design pick the style unless the customer has a preference. This short length sits right over the knee. 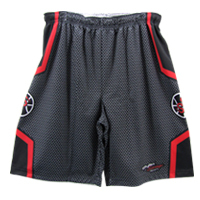 This cut of shorts is slightly longer and most commonly used for Basketball. This item comes as reversible or non-reversible. This short cut is a full wrap around panel. If you want pockets they sit right in the side of the short with a seamless flap allowing the art to be unaffected. 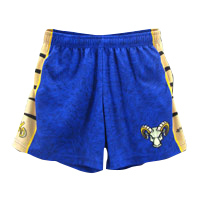 Our women’s shorts cut has been used widely for lacrosse and volleyball but can be used for any desired sport. You can elect to have pockets or no pockets. They match great with the women’s racer back reversible. The compression shorts are great for wearing them under a skort if you elect to go with a skort without the compression shorts sewn in. They are also popular for track teams or volleyball with a fitted cut and poly/spandex feel. 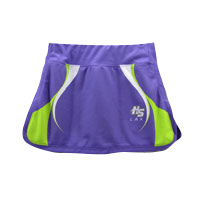 We have primarily made the skort for lacrosse, but it could also be used for field hockey, cheerleading, and any other applicable team sport. Some girls like to wear their own spandex under them so you have the option to have our compression shorts sewn in, or just the skort shell. They are very comfortable and also match well with the women’s racer back reversible.